Founded in 1888, JT is the oldest and largest telecoms operator in the Channel Islands and is fully owned by the people of Jersey. 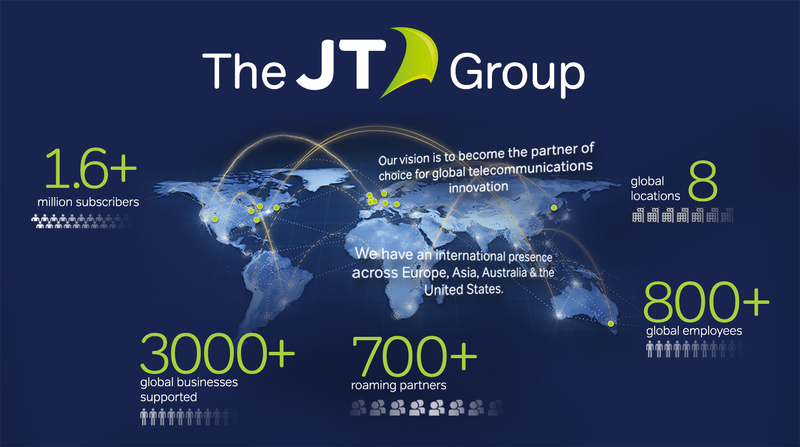 Communication is an innovative and rapidly evolving industry and as well as serving the needs of its Channel Island customers, JT’s expansion in the international marketplace has enabled it to re-invest global revenues back to our home islands. JT’s growth into emerging areas has included the Internet of Things (IoT) where JT now provides cellular connectivity and remote management of devices around the globe. This expansion has included fraud protection and bulk messaging services, helping both our residential and business customers to stay safe when accessing account information, or making mobile payments online. JT employs more than 400 people in Jersey and Guernsey and another 300 worldwide. It powers more than 1.6 million SIMs active worldwide and provides products and services to over 2,000 enterprise customers in the Channel Islands. In 2018, the company completed a socially inclusive project to install a full-fibre network in Jersey, making the island the first jurisdiction in the world to have 100 per cent full-fibre connectivity in premises. Across both Guernsey and Jersey, JT has built a robust pan-island network, with undersea fibre-optic cables linking Jersey, Guernsey, the UK and France. Our customers in both islands benefit from the delivery of an Advanced award-winning 4G mobile network and plans underway for a 5G network, which will ensure the Channel Islands continue to enjoy the most advanced connectivity to support their needs. Kay Fiskers Plads 9, 4. Look out for the green arrows to play and watch videos throughout this report. Where you see a green arrow, please click to view the video.